Edwin Brook Dickson was christened at Christ Church, South Ossett on the 5th May 1878, the son of grocer Mark Dickson and his wife Sarah Ann (nee Sykes) who had married in the Pontefract Registration District in 1875. In 1881, Edwin was living with his parents, Mark and Sarah Ann on Bank Street, Ossett. Mark (55) and Sarah Ann (39) who also had a daughter, Kate (4). Also living with them was a step-daughter, Annie Sykes (8). In 1891, the family have now moved to New Street, Ossett where Mark continues his trade as a grocer. Edwin is a 14 year old errand-boy and the two girls are working as rag sorters. In 1900 Mark Dickson died at the age 74. By 1901, Edwin has moved again and is living with his widowed mother, Sarah Ann, and his sister Kate on Lionel Street, Ossett. He is now working as a joiner/carpenter. Edwin Dickson was a 25 year-old joiner when he was married on the 21st January 1903 to 24 year-old Hannah Maria Thompson of Station Road, Ossett at Christ Church, South Ossett. In 1911, Edwin is living with wife of 8 years, Hannah Maria at 2, Riley’s Buildings, Ossett. They have no children. Edwin Dickson enlisted at Ossett, but his Army Service record has not survived. His medal card indicates that he was awarded the Victory and British medals, but not the 1914-15 Star, indicating that he did not serve abroad before the 31st of December 1915 although he may have enlisted earlier than this date. The 2nd/4th Battalion of KOYLI was formed at Wakefield on 30 September 1914 as a second line unit. On the 1st of March 1915 the battalion moved to Bulwell and was attached to 187th Brigade in the 62nd (2nd West Riding) Division. They moved in April 1915 to Strensall, York and then in May to Beverley, going on in November to Gateshead. In January 1916 they moved to Larkhill and in June 1916 to Flixton Park, near Bungay. They moved again in October 1916 to Wellingborough and landed at Le Havre on the 15th January 1917. Edwin Dickson's 62 Division were out of the line for some four weeks, during which they trained and provided working parties. They returned to front line duty at Lagnicourt on the 25/26th June 1917 and continued normal routine trench duties in the Bullecourt, Noreuil and Lagnicourt sectors until handing over to 3 Division between the 9th and 12th of October 1917. Edwin Dickson's 187th Brigade would have been involved in night-time patrols into No Man's Land and small raids on enemy positions as part of the effort to gain control of No Man's Land. There was no specific battle or recorded action on the date that Edwin Dixon died and it assumed that died from sniper fire, enemy shelling or whilst out with a British raiding party. 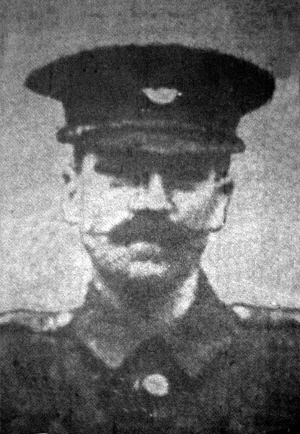 Acting Corporal Edwin B. Dickson died on the 20th July 1917, aged 39 years. His home was Park Square, Ossett at the time of his death. 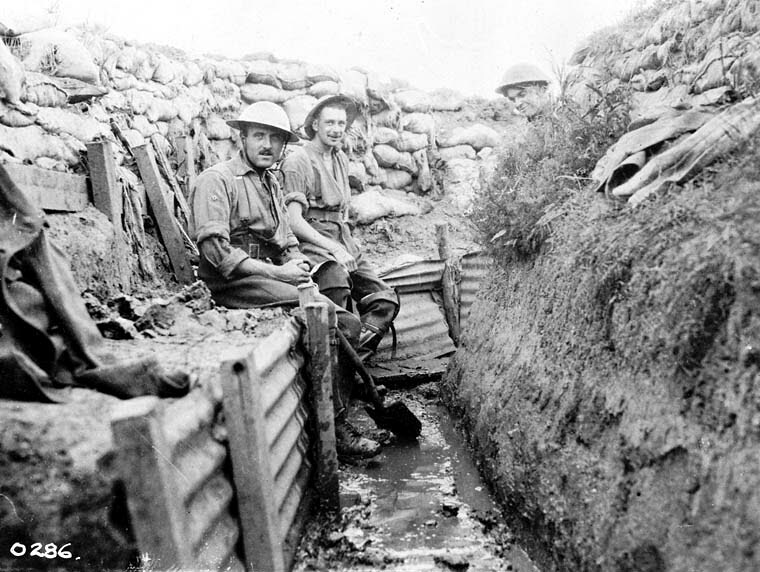 Above: British soldiers in a typical WW1 trench. Edwin Dickson is buried at grave reference VII. E. 8. at the H.A.C. Cemetery, Ecoust-St. Mein 2, Ecoust-St.Mein is a village between Arras, Cambrai and Bapaume. H.A.C. Cemetery is about 800 metres south of the village on the west side of the D956 road to Beugenatre. The enemy positions from Doignies to Henin-sur-Cojeul, including the village of Ecoust, were captured on 2 April 1917, by the 4th Australian and 7th Divisions. This cemetery was begun by the 7th Division after the battle, when 27 of the 2nd H.A.C., who fell (with one exception) on the 31st March or the 1st April, were buried in what is now Plot I, Row A. After the German counter-attack near Lagnicourt on the 15th April, twelve Australian gunners were buried in the same row. Rows B, C and part of D were made in August and September 1918, when the ground had been recaptured by the 3rd Division after five months enemy occupation. The 120 graves thus made were the original H.A.C. Cemetery; but after the Armistice graves were added from the battlefields of Bullecourt and Ecoust and from a number of smaller burial grounds.